We provide a complete BBQ cleaning service that removes all traces of grease, fat, and carbon especially in the ares you can't see. We remove key components and deep clean them in specially equipped tanks, using environmentally treatments. 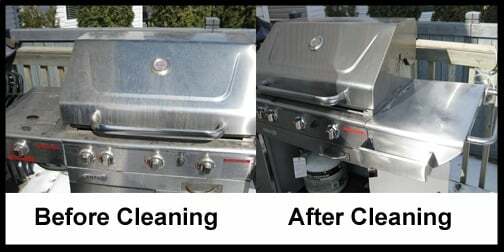 Seeing is believing and we offer a few before and after picture to show you what we can do to a dirty grill. Look at the photos page to see some of the results we have attained in the past. When you grill you should see a blue flame, with the odd yellow flame. If you see yellow more than blue than you need to get your grill cleaned. You could have cob webs or insects inside your burner, or they could be plugged. A lot of people believe that the cob webs and dead insects will burn up when you light the grill. But all that goes inside the burner is gas. Combustion needs air and when the gas exits the burner, when ignited, and mixes with the air, that is when you get a flame. We have cleaned BBQs that were all yellow or the flame is only a couple of inches along the back of the grill . This gives you hot and cold spots when cooking. We try to get your burners showing the blue flame all the way across it and that gives you even heat all over your grill. Use a good oil like olive oil to rub on your grill racks. Peanut oil is better but because of allergies we don't recommend it. Vegetable oil burns off too quickly and makes your grill racks sticky. If you prefer another oil, like grape seed oil, you can use it, just make sure that your oil has a high burning temperature. Season your cast grill racks before cooking on them, rub oil on them, warm them up, then let them cool and then do it again. Do this about three times to start and then to maintain them, clean them well and reapply oil as mentioned once a month depending on how often you use your grill. This will extend the life of your cast grills. We don't recommend any of the sprays to put on your grill and they contain other chemicals that can do harm to your grill and they leave a residue on your grill. We have heard many times over that all you need to do is just take a hose or a pressure washer to the grill to clean it. Sure you can do that...but we have had to go and clean that same BBQ and then do some expensive repairs. You see, what happens when you use a hose or pressure washer is you are pushing that grease and debris around in your BBQ and it goes where it wants to and sometimes it goes into your burners, and sometimes into your gas valves. If it goes in there you can expect to pay alot to repair it or you end up replacing your grill. That is why we don't use hoses or pressure washers, and besides that it would make a mess of your deck, grease and debris everywhere. That's why we do everything by hand, and get superior results and no mess. Don't use harsh chemicals to clean your BBQ or steel wool (like SOS pads). Harsh chemicals can leave a residue that could transfer to your food, or get on the ground where small children are playing or your pets could lick it up. Steel wool will leave scratches and ruin the finish of your BBQ. We use environmentally friendly, food safe products and you can use your grill right after we clean it. Don't let grease and debris build up in your grill as this could cause a fire as the debris can keep the heat long after your grill is turned off. Watch for grease and debris if it is falling onto your wood deck as hot embers could smoulder and then catch fire. If you use a brush, make sure it is stainless steel or brass. Steel will scratch the grill allowing grease and moisture in and will eventually destroy your grill rack. Watch to see if your bristles are falling out as these can stick to the grill then adhere to your food and then be ingested by you or your children. There has been many news articles about this. If you are really concerned about this, you could use the green 3M scrubbers - but use them on a COLD Grill. If pieces do come off the scrubber they will burn up when you preheat the grill. I have taken magnets and dragged them around the inside of a BBQ and the clump of bristles that stick to it is amazing. Most of the BBQ brushes are made in China and whether you pay $3.00 or $50.00 for your brush the result is the same. If you like to use a brush then buy the less expensive and replace them frequently.